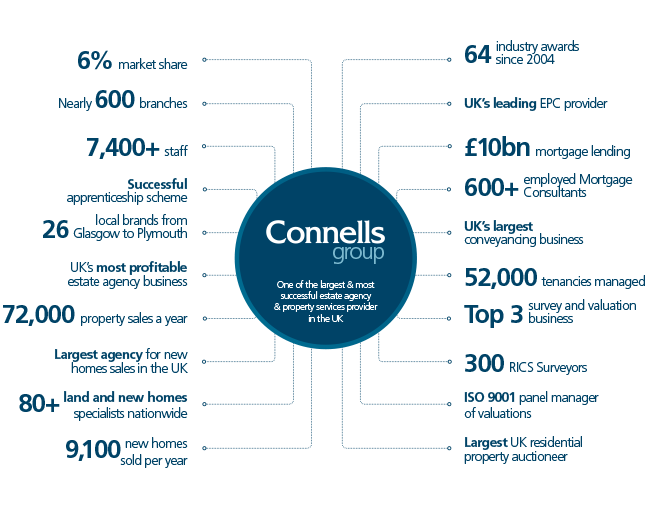 Founded in 1936 and with a network of nearly 600 branches nationwide, the Group combines residential sales and lettings expertise with a range of consumer and corporate services including new homes, mortgage services, conveyancing, EPC provision, surveying, corporate lettings, asset management, land & planning, LPA receivers and auctions. Alongside the Connells brand, the Group trades under other well-known and trusted local names including Allen & Harris, Ashley Adams, Atkinson Stilgoe, Bagshaws Residential, Barnard Marcus, Brown & Merry, Burchell Edwards, Fox & Sons, Gascoigne Halman, Hurfords, Jones & Chapman, Knight Partnership, Manners & Harrison, Pattison Lane, Paul Dubberley, Peter Alan, Roger Platt, Rook Matthews Sayer, Sequence, Sharman Quinney, Shipways, Swetenhams, Thomas George and William H Brown. Our branches cover most of the UK so whether you need estate agency services in Scotland or on the South-East coast, we can help. Connells Group is a subsidiary of the Skipton Building Society, one of the UK’s largest providers of financial services and products. We are regularly singled out for national and regional awards. View our list of accolades. Since opening our first branch in 1936, we've grown into one of UK's most successful estate agency networks. Read our key milestones. Connells Group has one of the industry's most experienced leadership teams. View details of our board of directors.